Dental Myth: Only the sugar in sweets and desserts are bad for teeth. Dental Fact: Many foods have natural sugars in them. Both natural and processed sugars can cause tooth decay if they stay on teeth. It is important to limit the amount of sweets you consume and to brush and floss twice a day. Dental Myth: There is nothing that I can do to help myself overcome my fear. Dental Myth: Everybody needs false teeth or dentures when they get older. Dental Fact: Improvements in dental care allow more and more people to keep their teeth throughout their lives. With daily brushing, flossing and regular professional dental cleanings, examinations and treatment, it is reasonable to have your natural teeth throughout your life. Dental Myth: Going to the dentist and having an injection into my gum will be excruciatingly painful. Dental Fact: This is not always the case. Often patients can take painkillers to take away the pain, as well as this, dentists can use distraction techniques to try to take their patients minds away from what is happening. Modern advances in technology mean that there are new ways to make painless injections into the gums, the most common of these is the wand. Dental Myth: As long as my teeth seem okay, and I’m not experiencing any problems, I don’t need to visit the dentist. Dental Fact: Regular check ups at the dentist are extremely important. You may think that your teeth are fine, but a visit to the dentist to make sure is always advisable. If you do find that you need treatment, it is much easier, less painful to treat early. Leaving it could result in having much more lengthy and expensive surgery. Dental Myth: All wisdom teeth need to be extracted. Dental Fact: Wisdom teeth need to be extracted when there are issues with the teeth. Often a wisdom tooth needs to be extracted because the tooth is impacted, infected, has a cavity or decay, or there is not room for the tooth in the jaw bone. Dental Fact: This is simply not the case. If you experience a problem with your oral health, leaving it alone and taking pain killers will not help. You should visit your dentist and get to the bottom of the problem. Leaving it alone will mean that it only gets worse, and you may be forced to undergo much more lengthy, painful and expensive treatment than you would have if you had seen your dentist straight away. Dental Myth: Tooth-colored fillings, veneers and crowns will get lighter with teeth bleaching. Dental Fact: Teeth whitening only affects natural tooth structure. Any tooth-colored filling materials, veneers, crowns, bridges and partials will NOT change color with tooth whitening or tooth bleaching. 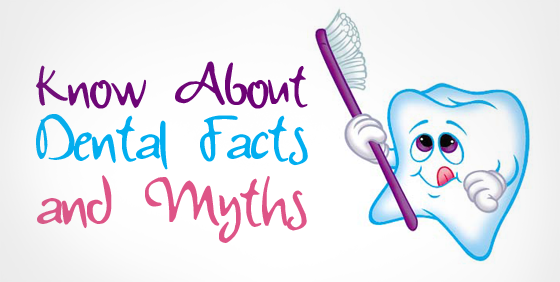 Dental Myth: My parents did not have any cavities or dental problems, so I will not either. Dental Fact: Genetics plays a small role in dental health. The main component in predicting dental health is the level of oral hygiene that a patient has. Brushing twice a day and flossing once a day, along with regular dental visits, will help keep your teeth and gums healthy.